Auto-updater and installer for Knights of the Force 2.1. Please note, this is for Windows users only. - Fixed an issue where the Updater displayed too large of a file path. It is now scaled back to only display the name of the file. - The Updater will now display how large of an installation/update you're downloading. - The Launcher will now inform you if the Jedi Academy 1.01 patch hasn't been installed prior to updating. - Fixed an issue present in earlier versions of the launcher which prevented the mod from opening after updating. 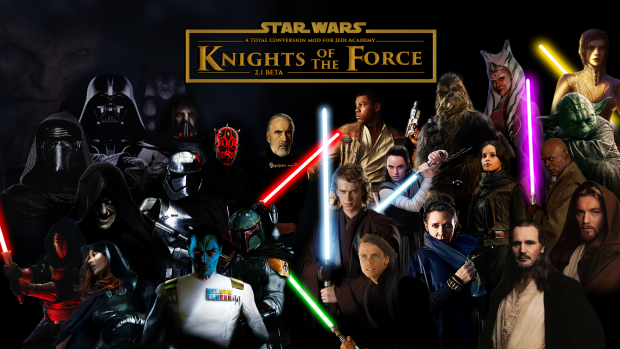 Description: Auto-updater and launcher for Knights of the Force 2.1, allowing patches and updates for the mod as necessary. Please note, this is for Windows users only. Installation Instructions: Extract the contents to your Gamedata folder. Note, you do NOT need to download the full mod for this to work, the updater will install all files for you. How to use: Run KotF-Launcher, and select update or install. The program will scan your KotF folder for any out of date files and download anything needed. While you can stop the download process at anytime, it is not recommended, as your files may be incomplete. Once the Updater has done its thing, it will take you back to the Launcher. Select Single Player or Multiplayer from the options on the bottom-right corner of the window, and play. Copyright/License: Other players may not share and modify this work without permission of original author. THIS FILE OR THIS LEVEL IS NOT MADE, DISTRIBUTED, OR SUPPORTED BY LUCASARTS, A DIVISION OF LUCASFILM ENTERTAINMENT COMPANY LTD. ELEMENTS ™ & (©) LUCASARTS, A DIVISION OF LUCASFILM ENTERTAINMENT COMPANY LTD.
How long does it take to download the update using the updater? For me it takes about 15 minutes. Make sure your base folder is clear of all mods. Send me a PM showing me your Gamedata folder please. what folder do the files go in? It's common with a lot of unknown exe files. It's not a virus. So if I download all the game using the updater, does it work? Can you please send me a print screen of your GameData folder (Jedi Academy), and other of the KotF folder? Linken233, thanks. That version of launcher allowed me to fully download the mod. Now it works! The game itself actually won't launch now, whether I'm trying to launch the base game or the mod. Did you download the newest launcher v3? what do you mean? Just hit Download Now! button and get the launcher. I have installed the Updater and extracted the files into GameData however, whenever I've launched it, it either stays on "Please wait, checking for updates!" or (for some reason) starts and loads up to 7% max and then just stays on that percentage forever and doesn't go beyond it. Is there a problem? Hey,i installed the game then kotf trough updater-i cant launch the game now because when i want to launch kotf i get that bloody message "couldnt load default.cfg" Im going crazy here as i already reinstalled the game flippin twice! !lways the same message! WTF do i need to do to start playing?? Any advice/help would be much appriciated folks!Thanks. Tried that 1st thing.Installed it 3 times-same problem every time. has something if the computer has been shut down while updating ? Is anyone able to help me? Anyone know how to fix this fu..kin "couldnt load default.cfg" message? Greetings, I have a problem with the mod. As soon as I launch SP and select something from the menu (campaign, missions, maps) the game crashes - "Kotf 2.1 has stopped working". Any ideas on how to fix it? In my gamedata folder I have only files from launcher zip and originall game files. Nothing else. Might be your anti-virus software throwing a fit.